A new high quality seeds mixture for extended grazing and comprising exclusively of the Aberystwyth-bred Aber High Sugar Grasses with a compatible white clover blend has been launched at the Royal Welsh Grassland Event by British Seed Houses. AberXtend provides 10 percent more dry matter yield in the early spring and 13 percent more in the autumn than the average of comparable varieties, according to the independent Recommended List trial data. In addition to season-long yield, AberXtend provides the highest quality grazing with three of the top five listed intermediate diploid varieties for grazing D-value in AberDart HSG, AberStar HSG and AberMagic HSG, plus the new late heading tetraploid AberGain HSG, which is the highest ranked in its category for overall grazing yield and ME yield. The mixture also includes a blend of small and medium leaf white clover varieties, all bred for their compatibility with the Aber ryegrasses and suitable for rotational or set-stocked grazing systems for cattle and sheep. “Extending the grazing season can be worth an estimated £60-£75/day in reduced concentrate feed costs alone for a 150 cow dairy herd, and that’s before savings in conserved forage and the costs associated with housing are taken into consideration,” said Paul Billings, Agriculture Director for British Seed Houses. “Similar assumptions can be made for beef and sheep systems where quality grazing can be made available earlier in the spring or later into the autumn. 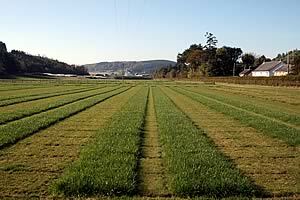 The Aber ryegrass and clover varieties are all bred at the Institute of Biological, Environmental and Rural Sciences (IBERS) Aberystwyth University, as part of the long term forage breeding programme.